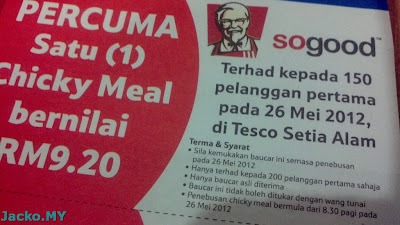 Jacko.MY: KFC, So Good? So Confuse? I didn't really ban it like others suggested in the social networks 'cause I don't frequent the fast food restaurant, not even once a year (I prefer the fried chicken by Yo Yo Ice). 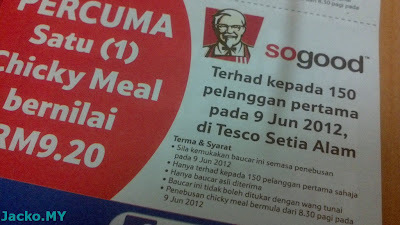 With so many KFC surrounding me, there is one at the shop area, there is one in Tesco Setia Alam and now there is one in 2-day old SCM. How to attract customers with so close range competition? Terhad kepada X pelanggan pertama translates to "limited to the first X customers". So now what is the deal? 150 or 200? Will I be honored the free Chicky Meal if I were the 151st customer? Or will I get assaulted like the YouTube video if I argue with the staff? If and only if I could wake up that early in weekend to queue for the Chicky Meal.